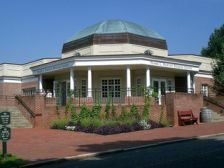 The Museum of Early Southern Decorative Arts (MESDA), founded in Winston-Salem in 1965 by Frank L. Horton, is dedicated to exhibiting and researching the regional decorative arts of the South before 1821. Building on a core collection that belonged to Horton and his mother, Theo Liipfert Horton Taliaferro, the holdings of MESDA include furniture, paintings, textiles, ceramics, silver, and other metalware made and used in Maryland, Virginia, the Carolinas, Georgia, Kentucky, and Tennessee. The museum is a collection of 19 room-settings and 6 galleries built into what was once a grocery store in Old Salem. Exhibits include a seventeenth-century Virginia great hall, a one-room Maryland plantation dwelling, a backcountry North Carolina log house, and a parlor from Charleston, S.C. MESDA's interpretation and education programs reflect the fundamental divisions and sharp cultural contrasts found in the South between the Chesapeake region, the lowcountry, and the backcountry (Piedmont). MESDA includes a research center, open to scholars and the general public, with a photographic catalog of approximately 15,000 objects and a comprehensive listing of documentary information on more than 60,000 artisans in the South working in 125 different trades. A library with more than 5,000 volumes on subjects related to the decorative arts is supplemented by extensive microform holdings of primary documents. Publications from MESDA include the Journal of Early Southern Decorative Arts and a newsletter, The Luminary, both published twice a year. The museum has also published several books on early southern decorative arts. John Bivins and Forsyth Alexander, The Regional Arts of the Early South: A Sampling from the Collection of the Museum of Early Southern Decorative Arts (1991). "Frank's Place," The Luminary 9 (Winter 1988). "MESDA's Silver Jubilee," The Luminary 11 (Winter 1990). 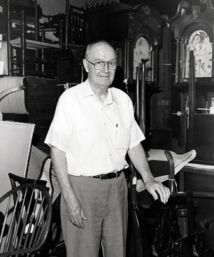 Frank L. Horton, founder of MESDA. Image courtesy of Digital Forsyth. Available from http://www.digitalforsyth.org/photos/12827 (accessed August 24, 2012). Museum of Early Southern Decorative Arts. Image courtesy of Flickr user Leslie Johnston. Available from http://www.flickr.com/photos/lljohnston/1118280493/ (available from August 24, 2012). We don’t have any additional resources in NCpedia that would help with your question, but I have a few thoughts. I also see in WorldCat a few publications that relate to his work: https://www.worldcat.org/search?q=kw%3Abartlam%2C+john&dblist=638&fq=s0%.... (WorldCat is an online catalog that searches the holding of libraries and collections around the world – it’s a great way to locate books on a topic and then see if a library near you might have them).